When you write a c++ program, the next step is to compile the program before running it. 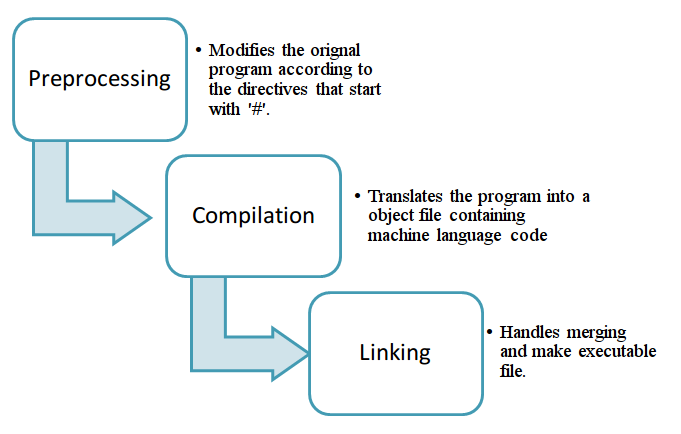 The compilation is the process which convert the program written in human readable language like C, C++ etc into a machine code, directly understood by the Central Processing Unit. There are many stages involved in creating a executable file from the source file. The stages include Preprocessing, Compiling and Linking in C++. This means that even if the program gets compiled, it may result in not running as errors may arise during the linking phase. Hence most IDE (Integrated Development Environment ) like Eclipse, Geany etc consider the term build for transforming source code file to an executable file. Now, how you compile a certain program, that depends upon operating system and compiler. These days compilers are run from IDE (Integrated Development Environment) that contains building and analysis tools. You just have to click the menu to compile the program and then execute it. But actually the whole process occurs in different phases. That is where compiling and linking in c++ comes. This phase translates the program into a low level assembly level code. The compiler takes the preprocessed file ( without any directives) and generates an object file containing assembly level code. Now, the object file created is in the binary form. In the object file created, each line describes one low level machine level instruction . The conversion to assembly language is important as it is common output language for many compilers of different high-level languages. There is also assembly phase which converts these object files in assembly code into machine level instructions and the file created is a relocatable object code. Hence, the compilation phase generates the relocatable object program and this program can be used in different places without have to compile again. But you still can’t run these object files until to convert them into executable file, now here linker comes into play, which links all the object files to generate single executable file. Linking as the name suggests, refers to creation of a single executable file from multiple object files. The file created after linking is ready to be loaded into memory and executed by the system . There is difference in linking and compilation when it comes to understanding errors. Compiler shows errors in syntax, for example semi-colon not mentioned, data type not defined etc but if there is an error that function has been defined multiple times, then this error is from linker as its indicating that two or more source code files have the same meaning and that is leading to an error.